India and Rajasthan Royals fast bowler Sreesanth has been handed a life ban by the BCCI for his involvement in spot-fixing in IPL 2013. His Royals team-mate and Mumbai spinner Ankeet Chavan was also banned for life, following the board's disciplinary committee meeting in Delhi on Friday. Amit Singh, the Gujarat cricketer-turned-bookie, got a five-year ban, while Saurashtra and Royals seamer Siddharth Trivedi was suspended for a year for not reporting an approach among other things. Twenty-one-year-old Harmeet Singh, who was part of India's Under-19 World Cup winning team in 2012 and had a similar charge against him as Trivedi, has been cleared of wrongdoing due to a lack of evidence against him. There has been no ruling as yet on offspinner Ajit Chandila, the third Royals player who was arrested in May, since he is yet to be questioned by Ravi Sawani, who led the BCCI's probe into the matter and whose report formed the basis for the board's actions. Save for a few days when Chandila was out on bail due to a death in the family, he has been in police or judicial custody since his arrest on May 16, meaning Sawani could not speak to him. However, he was granted bail on September 9, so his case should come up soon. Sreesanth and Chavan were out on bail since June 11. While Trivedi is banned from playing any BCCI-organised cricket, the other three are banned from playing any such cricket or in any way being associated with activities of the Indian board or its affiliates. The penalties were decided upon by the disciplinary committee, comprising board president N Srinivasan and vice-presidents Arun Jaitley and Niranjan Shah. The ban means Trivedi will have to be replaced in Royals' squad for the Champions League T20, which begins on September 21. Sreesanth tweeted soon after the news of his ban broke, saying he found it "surprising". "Been tracking the news channels... Me getting a life ban??!! Very surprising," he said. The tweet was deleted soon after. The Sawani report had recommended bans ranging from five years to life for the four players it found guilty on multiple accounts, including "match-fixing" and "seeking or offering a bribe as a reward for match-fixing", the Indian Express reported earlier in the day. Despite Sreesanth's "surprise", a BCCI insider revealed the committee was unanimous in handing him a life ban, with the intention of sending out a message. Amit Singh, the source said, benefitted from the fact that he wasn't involved in IPL 2013 as a player. "Moreover, even though he has introduced players to bookies, it has been established that he hasn't played any direct part in fixing. However, since he is a registered player with BCCI, he falls in the ambit of the BCCI ACSU code. As a result, five years was sought to be a suitable punishment," the source said. However, the committee overruled Sawani's guilty ruling on Harmeet Singh, its sole divergence from the recommendations. Harmeet was given benefit of doubt. Since he was coerced into a solitary meeting, reported it to the Rajasthan Royals team management and ACSU immediately after Chandila's arrest and then co-operated with the police, it was felt it would be too harsh to spoil a youngster's career. The disciplinary committee's task was made relatively easy by the tough tone of the final report, which said none of the players were naive to the propositions of manipulation. "There is no specific mitigating factor that would require any mercy while sanctioning the aforesaid guilty players," Sawani said in the report. "Sreesanth has played a number of international games and was part of the Indian national team which won the inaugural T20 World Cup, 2007 and ICC Cricket World Cup in 2011. He has received the ICC ACSU education programme on many occasions. In any case all the three players of Rajasthan Royals who are now being accused and found guilty by the under-signed received the ICC Education Programme just prior to the beginning of the IPL-6 season i.e. on April 5, 2013. The programme was delivered to the entire Rajasthan Royals team by Mr Arrie De Bear, regional security manager of the ICC ACSU. "Obviously, the anti-corruption education given to the three players had no impact on the conduct. Therefore, the three players deserve no leniency whatsoever." The players, minus Chandila, were summoned by the board to present their case in the disciplinary committee meeting in Delhi. 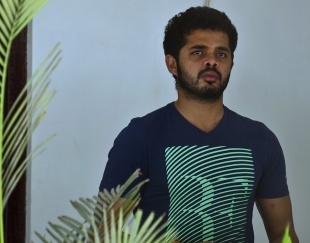 Sreesanth, Chavan and Chandila were arrested by Delhi Police on May 16 in Mumbai, for the alleged fulfilling of promises made to bookmakers, along with eleven bookies including Amit Singh. Royals later suspended their players and the BCCI set up an inquiry into the matter, headed by its Anti-Corruption and Security Unit chief Sawani. Apart from the action taken by the board, the players face possible prison sentences should they be found guilty in a court of law. They were among 39 persons named in the Delhi Police's chargesheet on alleged corruption in the IPL in July, charged with criminal conspiracy, cheating and dishonesty under sections of the Indian Penal Code and the Maharashtra Control of Organised Crime Act.